Can a touchscreen make digital photo frames worthwhile? I have to be honest; I've never really understood the appeal of having a wired screen on your wall to look at photos when you can just print them out, in physical reality, for about a tenth of the price. So, why should you spend nigh on £100 on the Pantouch (touched by Peter Pan or Pan the goat-god?) 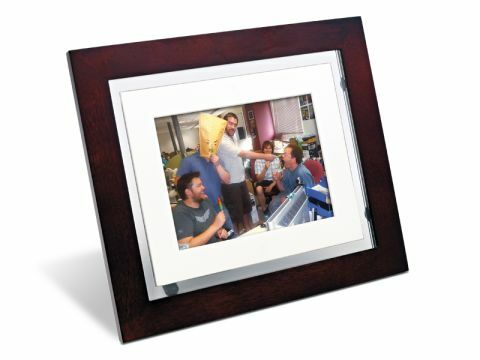 digital photo frame? Like the O2 Joggler, it incorporates a touchscreen, and like the O2 Joggler, it's about as sensitive as Joan Rivers at a 9/11 benefit gig. The tantalising promise of Wi-Fi connectivity is also let down by the fact that you will need to buy an additional external adapter. Maybe I'm being too harsh on the Pantouch. The screen is crisp and clear, and it happily accepts inputs from USB and flash devices; and comes with one charcoal and two white additional frames, which is AWESOME. On second thoughts, I wasn't being that harsh on the Pantouch. It's a frame, that you put on your wall, and unless you know a builder or fancy demolishing part of your house, it's forever going to have a power cable dangling from it. And when people walk past they'll think "oh it's another digital photo frame someone's wasted money on. Why can't they just print out their photos like normal people?"